Super Lawyers® recognizes outstanding lawyers, who have attained a high-degree of peer recognition and professional achievement, from more than 70 practice areas. The rigorous selection process is multi-phased including independent research, as well as 12 indicators of peer evaluations and professional achievement. Only 5% of attorneys will be selected as Super Lawyers each year. 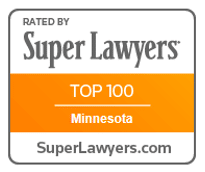 The Minnesota lawyers who receive the highest point totals during this selection process are further recognized in Minnesota Super Lawyers Top Lists, including the Top 10 and Top 100 Minnesota Super Lawyers. Click to learn more about the Super Lawyers® Selection Process. Patrick has been selected to the Super Lawyers List for each of the last five years. On top of that, Patrick has also been selected as a TOP 100 Minnnesota Super Lawyer for the last three years straight. Patrick is a Board Certified Criminal Law Specialist, certified by the Minnesota State Bar Association. Patrick takes great pride in providing personal and expert representation in the areas of criminal defense and personal injury cases in both Minnesota and Wisconsin State and Federal Court. He has a proven track record of successful outcomes in both criminal defense and personal injury cases. Click here to learn more about Patrick and his law practice. 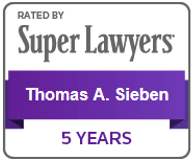 Tom was again selected as a Minnesota Super Lawyer for the fifth year in a row. Prior to that, Tom was recognized as a Rising Star every year from 2005 to 2012. Tom is a third-generation lawyer in his family and is devoted to the practice of criminal defense. He takes a strong and aggressive approach to his cases and his results speak for themselves. Click here to learn more about Tom and his law practice. If you are being investigated for a criminal offense, have been charged with a crime, or if you or a loved one has suffered personal injury please call today for a comprehensive free consultation. We will arrange an in-person meeting at our office, or will meet you wherever is most convenient for you. Call Sieben & Cotter at 651-455-1555 to arrange your free and comprehensive consultation, or send me a request for more information.